Another recipe from my fictional world—Auntie Thanike’s spring soup. Ingredients: 1 10 0z packet frozen broccoli rabe, or a fresh bunch. 1 small onion, or a couple of shallots. A little good quality vegetable oil, 2 packets Kikkoman miso soup with tofu and spinach, 4 cups water. You may also add a clove or two of garlic and cayenne pepper to taste. 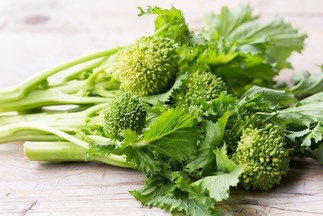 Method: If using fresh broccoli rabe, clean and trim and chop it. Chop your onion or shallots, heat a tablespoon or two of oil (olive or canola) in a deep saucepan, and add the vegetables. Saute the broccoli rabe with the onions if using fresh. (Note: if using garlic, add it after the other vegetables.) Then open the powdered soup packets, pour in, and add the water. If using frozen rabe, add it at this point. Bring to a boil and simmer for ten to fifteen minutes, until the greens are tender. You can liquidize the soup in a blender if you like. Variations: you can use spinach, kale, or other greens if you don’t like or can’t get broccoli rabe. You can also use a mild flavored chicken or vegetable broth. In that case, add about a tablespoon of soy sauce or some miso to the soup. Enjoy! And let me know what you think if you try it.